Amid the busy schedule of the Commission on Audit – Regional Office IX (COA-ROIX), they still found time to share their knowledge and experience in the auditing job to the would-be accountants of the Western Mindanao State University. Atty. David Oliver C. Kong, Service Chief of the Legal Services Sector and Ms. Visitacion Q. Mendoza, Supervising Auditor of the National Government Sector both from COA-ROIX graced the Auditing Forum held at the Moot Court, College of Law, WMSU last October 19, 2010. 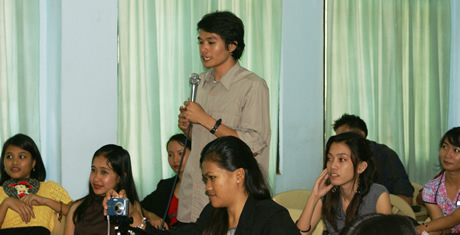 Kong discussed various topics ranging from the COA History, which can be traced back from the Spanish era; the Commission’s supreme power to audit the agencies of the government which has a constitutional basis and could not be overpowered by a subsequent enactment, and to audit private entities as may be provided by law; and COA’s independence and functions, among others. On the other hand, Mendoza spoke on the Philippine State Audit System, the relationship of audit and accountability, the organizational set-up of the Commission, the audit process, the institution of the New Government Accounting System in 2002 and how COA goes global. She further mentioned the international involvements of the Commission like its active membership in the Asian Association of Supreme Audit Institutions (ASOSAI) and the United Nations Board of Auditors (UNBOA). She also said that COA has chaired the UN Panel of External Auditors and is the External Auditor for the Food and Agriculture Organization (FAO). According to Mendoza, the international community has faith in the capabilities of Filipino auditors and accountants. “Bilib sila sa mga Filipino at Indian auditors” she said. Prior to these two speakers from COA, Ms. Elaine Grace S. Balancar and Ms. Reevah O. Osario, fourth year students of WMSU BS Accountancy (BSAC) discussed private auditing. The head of the Accountancy Department, Ms. Dezza Mohammad said “The purpose of this forum is for the students to learn and be updated.” She also stressed the importance of going beyond what the book says and having this forum is another mode of acquiring knowledge.